Opus understood our vision for our downtown headquarters and worked diligently to bring this vision to life. 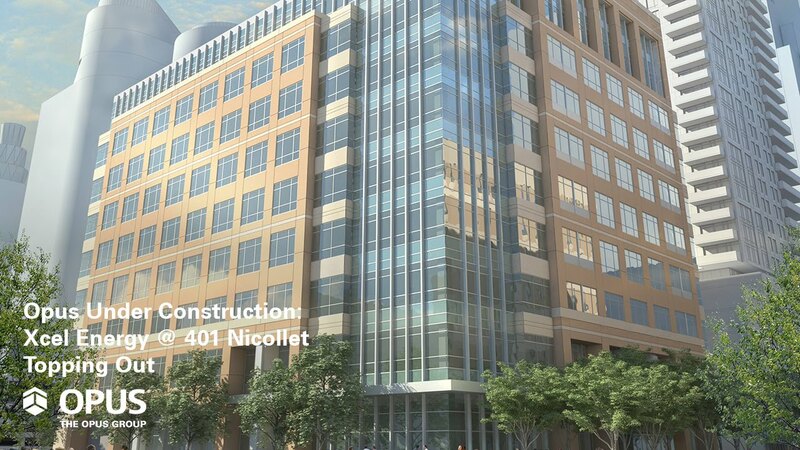 The new Xcel Energy office space supports our business mission, consolidates our workforce and creates a unified campus. The contemporary aesthetics of the office headquarters expansion use and improve the building’s urban context. A skyway spanning Nicollet Mall connects the two buildings of the office campus. The lobby of the building features corporate branding and excellent views of the streetscape, which is currently being renovated. The breakroom features excellent city views. Collaborative workspaces modernize Xcel’s office building for today’s workforce. In addition to improving the productivity of its workforce, the new building will help Xcel attract and retain top talent. 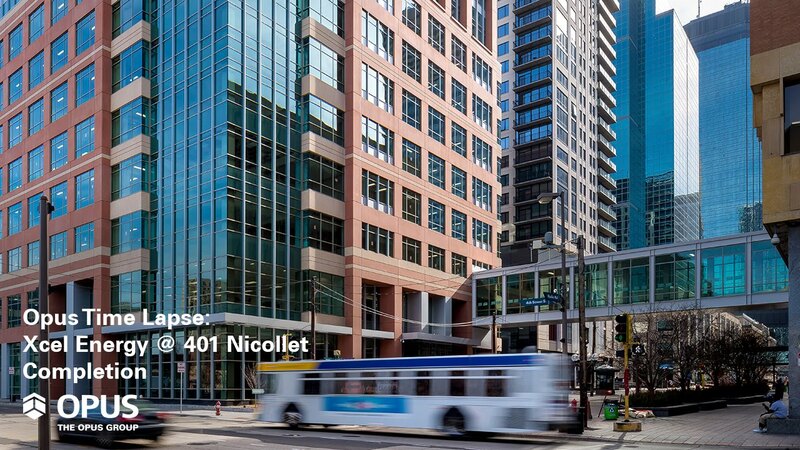 Located directly across the street from Xcel Energy’s corporate headquarters, 401 Nicollet was the perfect location for the company to develop a second office tower and create a two-building campus in downtown Minneapolis. With the site chosen, Xcel selected The Opus Group because of its extensive experience in the office sector to help deliver its vision. Experienced in office space development, Opus used its integrated design-build approach to design and construct a building that achieved Xcel’s goal of increasing operating efficiency for company employees. Committed to the city of Minneapolis, both Xcel and Opus ensured that facility will enhance the vitality of downtown and Nicollet Mall, in particular. The aesthetics of the nine-story, 222,000-square-foot building, designed in-house by Opus AE Group, L.L.C., are contemporary, reflecting the architectural design aspects of the surrounding urban context, while also adding fresh ideas. Materials consist of glass curtain wall and cast stone with architectural detail including banding elements, metal accents and strong vertical mullions. The subtle interlace of materials is reminiscent of the warmth and permanence of Xcel Energy's current headquarters and the nearby Minneapolis Central Library's transparent glass façade. To enhance the central campus feel and improve workforce efficiency, a skyway spans Nicollet Mall, connecting the two buildings. Additionally, the new building features collaborative work spaces that assist with recruiting and retaining talented professionals. As an environmental leader, Xcel is committed to having an energy-efficient building, and a central goal of the building became maximizing sustainability. With deep experience in creating LEED certified buildings, Opus honored Xcel’s desire by targeting LEED Core and Shell Silver Certification. In conjunction with the interior designer, DLR Group, Opus targeted LEED Commercial Interiors Gold Certification for that portion of the project. Of various sustainable strategies employed, the use of recycled material sourcing deserves special note. The team used the materials from the demolished ramp that had previously been at the site as fill material, which saved on trucking, fuel consumption and the import of virgin material. Over 95% of waste material generated on the project was diverted from landfills and recycled. Construction began in July 2014. Six months into construction, Xcel asked Opus to expedite the completion of the building to allow them to move in six weeks ahead of schedule. The team determined a solution to achieve that goal and even turned over the building in April 2016 one week ahead of the expedited schedule.